Hey there! Thanks for dropping by Hoopin' in Brooklyn! Take a look around and grab the RSS feed to stay updated. See you around! Yesterday (May 1) I set up ‘shop’ in McCarren Park along with my friend Jenn for the first time at the Artists and Fleas market. This was something new for us that we wanted to try, and it was pretty successful. 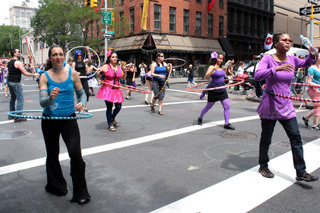 We each sold three hoops as well as oodles of fun and hip hair things. I’m not sure if we’ll be back yet, we have a few other markets to check out and see if we’d be better there. It was a fun time and the people running it are super nice. Now available are pretty ribbon hoops. I use high quality ribbons accented with cloth tape to make you a unique hoop that no one else has. Pick a ribbon, pick a tape accent color, it’s that easy! Ribbon hoops are $35 + S&H out of the NYC area. Within NYC I offer pick ups/drop offs for free. I’ve been experimenting with different ways to tape hoops. 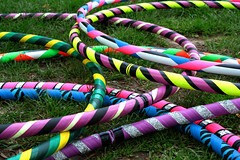 I discovered last year that ribbons with various prints/textures/finishes make great hoop material. They are unfortunately more expensive than gaff or vinyl but give the hoops a unique look. I’ve been wanting to try a hoop with velvet ribbon for a while and I finally went for it. I couldn’t use any old velvet ribbon, I had to use one with a unique look, so I went with a metallic looking silver velvet. The velvet pile on the ribbon is made from lurex threads which have a beautiful silvery look. The advantage of the velvet is that it makes learning tricks easier. It grips way better than regular gaffer tape! It does add a bit more weight to the hoop, but I find it’s not that noticeable. Available in either Silver or Gold velvet Ribbon with choice of one color of gaffer tape. for $35 plus S&H. I also found this really cool grosgrain ribbon with holographic tape on it already. It looks pretty cool! Available only in black/silver ribbon with your choice of gaffer color for $35. So, it snowed again in the NYC area causing white outs and over 12″ on the ground. For some folks that may not seem like a lot, but NYC takes it seriously as it can shut down a lot of things. Even in the cold weather, you can’t keep me from hooping! 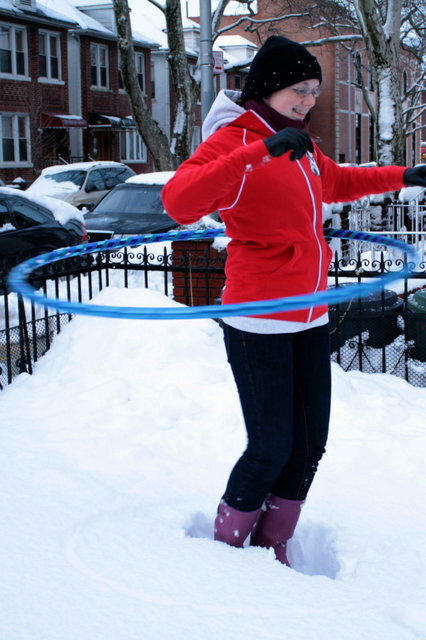 Thursday Winter Hoop Jams in NYC! Join me on Thursdays at the East 54th Street NYC Rec Center from 6:30pm-9pm in the gymnasium! ANY NYC rec center and good for the entire center (pool included!). If you do come, be sure to have a combination lock as well! They won’t let you in without one! Bring your hoop, bring your workout clothes, and let’s have some fun! On Thursdays the east 54th center has “Ladies’ Night” in the gym where it is open for us to use as we like and not have ‘dudes’ gawking at us. Bus: M15 to East 54th Street and 2nd Avenue. transfer to the #6 to 51st Street. This is going to be my main page for all things hoop related with me! Keep an eye out for new hoop designs, events, and sales! Want to buy a hoop? *Buy ANY two hoops and get %15 off both! Be sure to check out my Facebook Fan Page as well!